Whatever the important business occasion, it’s helpful to hold your meeting away from the tense hustle and bustle of a corporate setting. The right ambience for deal-making is often an opulent restaurant with sumptuous food. That’s been my preference. It was a valuable tactic for me when I was a young salesperson working my way into management. Such an occasion helped to convince an executive to put me in charge of his radio operation. Superb meals have helped persuade major clients to spend more money with my firm. And during economic downturns, great meals have even helped me collect large receivables — convincing clients to pay my firm first – before paying other vendors. Ironically, in this increasingly casual world, proper business-dining at a power lunch is often neglected. Once, when my firm’s young salesperson, who was fresh out of college, wanted to land an airline as a client, he wanted to take the president to lunch. The right ambience for deal-making is often an opulent restaurant with sumptuous food. It’s important to accept the invitation. If you’re nervous, remember it’s a golden opportunity for growth – to make a positive impression or to network with the team. You’ll be evaluated on your social skills. Arrive at least five minutes early. Be a chameleon and be mindful of your boss’s taste. If the boss is a professionally groomed person, dress in a sophisticated manner. Don’t be too casual or too ostentatious. Watch your boss to get a clue on what to order. Unless your host specifically suggests the most expensive item on the menu, choose a moderately priced meal – priced somewhere in the middle. 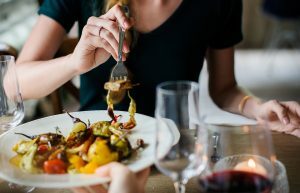 If you have dietary concerns, for example, an allergic reaction to shellfish or gluten, make sure you check with the restaurant in advance to discuss options. Avoid messy food. You don’t want to been seen with spaghetti sauce on your clothes. The meal shouldn’t be a distraction from an important business discussion. And don’t order an alcohol libation unless, of course, your boss and colleagues do. Breaking bread with a boss or client is an opportune time to be more candid than normal. Use the occasion to get to know the people better. But be professional. Be a good listener, don’t interrupt and ask open-ended questions to get more information. Introductory subjects before dining can range from travel to family. Avoid topics such as politics or religion. Be complimentary of the food and service. … make sure you finish the discussion before leaving the table. Make sure your cell phone is in silent mode, and don’t use it. Put your napkin in your lap when seated. Wait for your turn before ordering. Don’t put your elbows on the table. Before you eat, wait for everyone to be served. Be mindful of the pace at which everyone is eating. Don’t rush it but don’t be slower than the rest. Don’t talk with a mouthful. Should you inadvertently spill your water or drink – stay poised, apologize just once, and excuse yourself if you need to clean up. Be the person to ask a server to help clean the table. Follow your instincts. Unless it’s a comprehensive discussion, the time to do it is as soon as every person is finished eating. There can be exceptions. Whatever you decide, make sure you finish the discussion before leaving the table. If you’re invited by the boss, as the senior person, the boss pays. If someone else makes the invitation, that’s who pays. A well-written thank you note should be mailed the same day. If you extend the invitation, you pay. Use a credit card. But if you want to pay with cash, make certain you carry at least twice the amount of money you anticipate needing. You don’t want to be embarrassed. Leave a good tip. But don’t overdo it. Your boss or client won’t be impressed. If you’re in a habit of dining with clients, make certain you pay for half the meals. It’s very rare, but some clients insist on picking up the tab every time. Don’t argue. It might turn out well for you. I had one client, the CEO of a financial institution, who insisted on paying. After a few disagreements about paying the check, I stopped objecting. It turned out well. Each month, he paid my invoices within 10 minutes after I handed them to him, and he recommended me to his peers. He was a highly valued client for 15 years. Oh yes, if you’re a guest, be sure to graciously thank the host. A well-written thank you note should be mailed the same day. Public Speaking Tips – for Speeches in Accepting Awards, Honors — So you’re about to be honored for your pro bono work, volunteerism, or for creating a foundation to fund scholarships for education. But you get stage fright or don’t know how to most-effectively frame your acceptance speech? Join the crowd. How to Obtain the Most Profit from Speaking Opportunities — It’s one thing to be invited to speak at your industry’s major event. But it’s another to create the right impression for your hosts, your audience and prospective customers or clients. There’s more to it than you might think. 6 Tips to Increase the Quality, Quantity of Your Client Referrals — As a professional, you can ease the pain and save time in making sales calls, if you’re a good steward of your already-existing circle of associates and clients – potential centers of influence. Dos and Don’ts: How to Advance Your Career via Your Boss’s Boss — You can improve your career prospects by maximizing your communications – with your boss’s boss — if you respect the process. Not only will such opportunities optimize your prospects, they will give you a broader perspective about upper management’s concerns and insights. 8 Tips on How to Ask Your Boss for a Pay Raise — Your food, gas and other living costs have increased. But bosses give raises based on performance, so you need tips on how to ask your boss for a pay raise.